This video can be viewed by Quick Time. If you do not have the software installed in your computer, please download it by clicking the URL below. 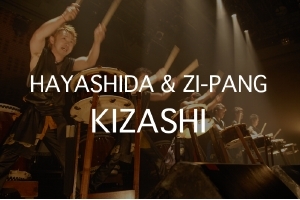 Breath-taking solo performance of Hiroyuki Hayashida, the pioneer Katsugi Daiko player. Starting from 3 Way Method, switching method and more difficult 2 Way Method are introduced. You can enjoy the one and only, new and unique expression in this movie. 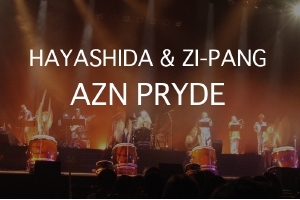 AZN PRYDE stands for Asian Pride. Hayashida produced this piece for Japanese people to have pride as Asians. A super session of Hayashida and leading young player, Hiroki Miki. Since they have known each other for long, although it’s a duo session, it is dynamic! Hayashida’s Oke Daiko technique and Miki’s unique rhythm sense will draw everyone to the shuffle beat play! One of the signature pieces of ZI-PANG with straight line rhythm, the best part of taiko. It has unison (beating the taiko together) to technical and intense solo. It expresses infinite power of people.